A screengrab taken from a video released by the Nigerian Islamist extremist group Boko Haram. Presidential candidate of the All Progressives Congress, APC, Muhammadu Buhari has defeated the Presidential Candidate of the Peoples Democratic Party, PDP, Atiku Abubakar, at Daura. A coalition of civic groups says multiple polling units across Nigeria have not opened more than four hours after the official start of the voting. The Independent National Electoral Commission (INEC) last Saturday announced a one-week delay to the election, just hours before it was due to get under way. Still, voting turnout appeared to be light as authorities tried to calm panicked residents.
" I have been voting since 1999". Former vice-president of Nigeria Atiku Abubakar is one of the electoral frontrunners against incumbent Mr Buhari in this year's elections. The president, voting in his northern hometown of Daura, jokingly checked the name on his wife's ballot. "They are late and it's not good because I wanted to vote on time and go home", said Akinola Kogo, 57, as he waited for registration to start at a Lagos primary school. He said polls opened two hours late and machines to read voting cards were not working. Elsewhere, some officials anxious that heavy security could intimidate potential voters. The ailing Buhari has been criticized for not delivering enough on his promises to tackle insecurity, the economy and corruption. 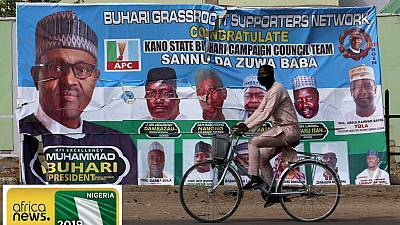 Many Nigerians said the election will be decided by economic issues after a rough term for Buhari during which the country suffered a rare, months-long recession and unemployment grew significantly to 23 percent. The blasts in the Borno state capital of Maiduguri came shortly before polls were to open. "The government made the decision - in consultation with the security agencies - that it is better and more useful for the security agents, including soldiers, police, Civil Defence, DSS, etc to focus their attention on providing security for the election throughout the state". Recall that Legit.ng previously reported that the European Union said on Monday, February 18, that none of its Election Observation Missions in Nigeria had left the country in spite of the postponement of the elections.